Levitan Realty > Blog > Uncategorized > OPEN HOUSES QUAIL WEST SUNDAY APRIL 7TH FROM 1-4PM! LAKE & GOLF COURSE VIEW! 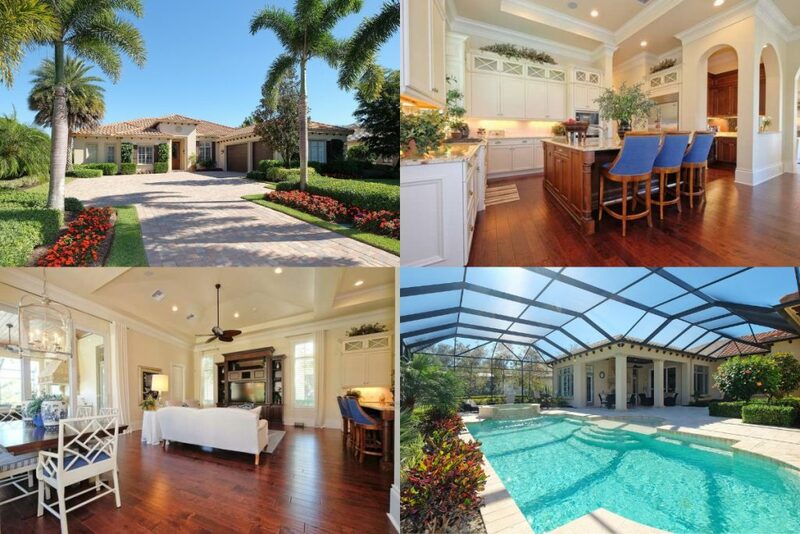 This 6-bedroom, 7-1/2 bath grand estate home is situated on a prime corner lot of Quail West. With a wide southern exposure, you can enjoy sunshine all day at the oversized pool and then sit around the outdoor fireplace to reflect on the spellbinding sunsets in the evenings. From the moment you enter this lavish estate, this home exudes contemporary elegance with wood and marble flooring, expansive master wing of the house even includes separate his-and-her bathrooms. There are 3 bedrooms upstairs, each with private baths. Upstairs guests can also enjoy having their own sitting/gathering area. (They even have their own washer and dryer!) The 6th bedroom is located on the 2nd floor of the separate one-car garage building. Home comes with a BRAND NEW screen enclosure over the lanai and a whole home generator. This home has to be seen to fully appreciate it. One of the best views in Quail West! This 4-BR+Den contemporary home is built up with a stemwall offering a dramatic view of both lake and golf course. The Great Room opens up to an expansive covered and open lanai that offers a 50-ft salt water lap pool with spa and sun shelf, outdoor seating area with a portable propane fire pit, & dining area with an outdoor bar/kitchen/gas grill with an upgraded floor drainage that is perfect for entertaining. Porcelain tile throughout the house extending to covered lanai. An outdoor MosquitoNix system is installed on lanai fence and house gutters. Sleek kitchen features 2 islands with floor to ceiling cabinets and a custom butler’s pantry with glass door cabinets, granite countertops and a wine cooler. Relax on the beautifully furnished Roche Bobois and Mitchell Gold living room sofa/suite and enjoy the fireplace featured in floor to ceiling iced quartz under the recessed LED tray ceiling lighting. The 2nd BR could be considered a second master with extra space and a double sink bathroom. The master bath includes dual shower heads & a rain shower. Come home to Quail West! House Membership is included in price with all assessments paid off.